U.S. Economic Collapse: Will It Occur? The real-time graphic of the U.S. Debt Clock going higher and higher is familiar to many. Where is the money going? Is a U.S. economic collapse coming? 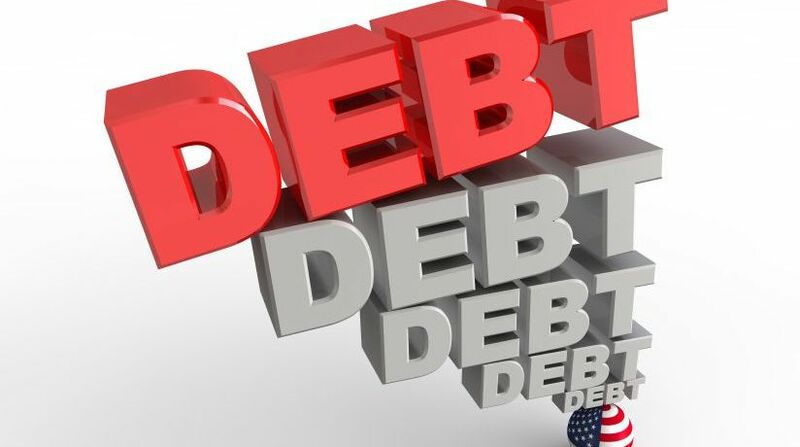 Will America's debt contribute to a U.S. economic collapse? A trillion dollars is beyond the grasp of ordinary people. What is a trillion dollars? A trillion dollars equals $1,000,000,000,000. That’s a 1 with 12 zeroes to the left of the decimal point. A trillion is a million millions. As of this writing, the U.S. debt is climbing toward $16 trillion. This amounts to over $50,000 of debt for every citizen. How did one of the wealthiest nations in modern history become so indebted? Some of the largest areas of U.S. expenditures include Medicare/Medicaid, Social Security, defense/wars, net interest on the debt and federal pensions. Debt comes when we spend more than we earn. Many who go into debt do so with the hope that future earnings will make it possible to pay the deficit. There is a great deal of wealth in America; but increasingly, the wealthiest seem to get richer while more people slip below the poverty line each year. The U.S. Census Bureau reported that “nationally, the poverty rate increased from 14.3 percent in the 2009 ACS [American Community Survey] to 15.3 percent in the 2010 ACS. The number of people in poverty increased from 42.9 million to 46.2 million during the same time period” (“Poverty: 2009 and 2010,” October 2011). “Overall, 44 million people were on food stamps on a monthly basis in 2011, compared with 17 million in 2000, according to the U.S. Department of Agriculture” (“The Number of Ph.D.s on Public Aid Triples in U.S.,” ABC News, May 9, 2012). When you don’t have enough money to pay your bills, you must borrow it. This is also true for the United States when obligations have to be met. Government debt is often held by the public in the form of Treasury securities, which are owned by individuals, corporations, the Federal Reserve System, local governments and foreign nations. Local, state and federal governments largely raise money through taxes, borrowing and selling securities. So where does the U.S. currently stand in terms of its debt? USgovernmentspending.com provides the following overview: “Federal debt began the 20th century at less than 10 percent of GDP. It jerked above 30 percent as a result of World War I and then declined in the 1920s to 16.3 percent by 1929. Federal debt started to increase after the Crash of 1929, and rose above 40 percent in the depths of the Great Depression. “Federal debt exploded during World War II to over 120 percent of GDP, and then began a decline that bottomed out at 32 percent of GDP in 1974. Federal debt almost doubled in the 1980s, reaching 60 percent of GDP in 1990 and peaking at 66 percent of GDP in 1996, before declining to 56 percent in 2001. Federal debt started increasing again in the 2000s, reaching 70 percent of GDP in 2008. Then it exploded in the aftermath of the Crash of 2008, reaching 102 percent of GDP in 2011” (“U.S. Federal Debt Since 1900”). America, once known as one of the richest nations in history, has become a debtor nation. Even though most of the debt is owned by Americans, U.S. debt has increased dramatically in the past decade. It wasn’t too many years ago, during the presidency of Bill Clinton, that the United States had a surplus. Many factors in a free economy can challenge the effectiveness of its financial system. Greed and dishonesty by major companies have taken their toll. Recent scandals in the banking industry involving the sale of complicated financial instruments have undermined public trust. America has on its currency “In God We Trust.” Has this become an empty phrase? The prophet Malachi in the Old Testament mentions an important principle: “‘If you will not hear, and if you will not take it to heart, to give glory to My name,’ says the LORD of hosts, ‘I will send a curse upon you, and I will curse your blessings. Yes, I have cursed them already, because you do not take it to heart’” (Malachi 2:2). The United States of America has historically been a Christian-professing nation founded on Christian principles that include hard work, reverence for a Creator God and a desire to help others in need. While other nations possessed great national wealth, the spirit of enterprise and opportunity certainly propelled this young nation toward hope and prosperity. In the Bible the ancient nation of Israel began with blessings from God. Its citizens asked, “For what great nation is there that has God so near to it, as the LORD our God is to us, for whatever reason we may call upon Him?” (Deuteronomy 4:7). If a nation worships God in spirit and truth, many blessings are promised. Notice what God told the ancient Israelites. “Blessed shall you be in the city, and blessed shall you be in the country. Blessed shall be the fruit of your body, the produce of your ground and the increase of your herds, the increase of your cattle and the offspring of your flocks. Blessed shall be your basket and your kneading bowl. “Blessed shall you be when you come in, and blessed shall you be when you go out. The LORD will cause your enemies who rise against you to be defeated before your face; they shall come out against you one way and flee before you seven ways. “The LORD will command the blessing on you in your storehouses and in all to which you set your hand, and He will bless you in the land which the LORD your God is giving you. The LORD will establish you as a holy people to Himself, just as He has sworn to you, if you keep the commandments of the LORD your God and walk in His ways” (Deuteronomy 28:2-9). Continuing to explain the blessings for obedience, God said, “The LORD will open to you His good treasure, the heavens, to give the rain to your land in its season, and to bless all the work of your hand. You shall lend to many nations, but you shall not borrow” (verse 12). As for the status of those who must borrow, the Bible is clear: “The borrower is servant to the lender” (Proverbs 22:7, emphasis added). The staggering amount of national and personal debt could have serious repercussions, including a depression. If America does not pay its debts, difficult economic times could come for millions of people, especially those who depend on entitlements from the government. Wealthy civilizations that were known for their military power and influence have collapsed in the past. Will America join the list of ancient civilizations that lie in ruin? Incurring debt and not repaying it is a mark against the character of an individual as well as a nation. No family or nation can afford to live beyond its means indefinitely. The laws of economics, as well as the laws of God, show that default brings pain on all. God wants mankind to prosper (3 John 1:2), but God will not bless a family or nation that refuses to honor Him and pay its bills. Is it possible that a great nation with fantastic resources could end in financial ruin? The future is unclear as to what will happen in the years ahead. But it is sure that if Americans forsake their God and seek their own way, the blessings that have sustained us for decades will surely fade away. Because of sin, the Bible predicts a time of great trial for the descendants of the ancient Israelites and the whole world (Jeremiah 30:7; Mark 13:19). The United States needs to honor God and pay its bills if it wants to be blessed. Who Are the United States and Britain in Prophecy? Is God on the Wrong Side of History?